Several years ago, my family and I had the pleasure of seeing Gerald Charles Dickens, the great-great grandson of literary master Charles Dickens perform A Christmas Carol. He bears a striking resemblance to the author of this classic Christmas story. Dressed in a cravat, embroidered waistcoat, and frock coat he transported the audience to 1800’s London. In 1867, Charles Dickens originally toured the U.S. reading his literary works before captivated audiences. Historians report that A Christmas Carolwas his favorite piece to perform. Gerald Charles Dickens has embraced Dickens’ enthusiasm and it is indicated in his performance. It was “the best of times” to watch him leap, creep, laugh and cry performing his one-man show. 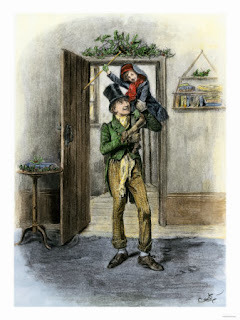 He embraced and characterized all 26 characters in this beloved Christmas tale of his ancestor. His only props were a hat rack, wing chair and table. Our children were familiar with the story but his version was mesmerizing holding their attention for the entire performance. It was a wonderful family memory for us. If you have the opportunity to see his performance, I highly recommend it for you and your family. Another Dickens ancestor, Cedric Charles Dickens, the great-grandson of Charles Dickens authored the book, Christmas with Dickens. He also wrote The Sayings of Charles Dickens, Drinking with Dickens, The "George and Vulture" in "Pickwick Papers", The Miracle of Pickwick or... the Goodness of Pickwickedness and Dining with Dickens. The writings of Charles Dickens has certainly sustained his family for generations, through various venues, including reissued books, new books themed after his characters, television shows, movies, musicals, annual Christmas plays and Dicken’s descendants’ careers. We should all strive to write a classic tale that has the potential of lasting for the entertainment of the “ghosts” of the past, present and future.